Atomic Style Home already had a website which they were pleased with. They needed the ability to be able to update their site themselves in an easy and quick manner. We incorporated their existing site within the framework of a content management system (Joomla) allowing them to make updates whenever they wanted. We also changed their hosting over to us. "Latonia Web Design was a pleasure to work with tailoring my website design specifically to my vision and needs. Best of all is the high degree of communication and feedback given through the entire design process with knowledgeable guidance and helpful suggestions throughout. Latonia Web Design now continues their service with regular updates and web traffic reports. The entire experience was polite, professional, diligent, and fun." Testimony by Rob McFadden, Owner of Atomic Style Home. This website was created for the Northern Kentucky Collaborative Group to explain the collaborative law process and to provide contact information for the collaboratively trained attorneys that are members of this Group. "Latonia Web Design was extremely helpful and very responsive to our needs in creating our website. Additionally, Latonia Web Design has provided our Group with exemplary continuing, on-going support. Our Group is looking forward to an on-going relationship with Latonia Web Design." Testimony by Ruth B. Jackson, Esq., President of NKCG. We were approached by "Promotion Mall Online" to develop their website. A vast quantity of promotional products are showcased from this site, where the buyer can easily contact "Promotion Mall Online" for all their promotional product needs. "Latonia Web Design is great. We wanted an online presence to bring our promotion solutions directly to the desktop of our clients. Our web site was created in a very timely and efficient manner. We also appreciate Latonia Web Design's attention to details of the internet and the on-going support in keeping our site up-to-date." Click on the screenshots below to open a new window to explore the site. 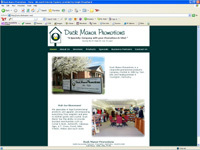 Duck Manor Promotions wanted a complete redesign of their website and for us to manage their hosting. "We asked Latonia Web Design to help update our current website, and through his patience and creative feedback we reconstructed every web page into a sharp, professional marketing tool for our company. We have had nothing but positive feedback from our clients and our business partners. Latonia Web Design has also been available for continued additions and changes to the site, as well as supplying important feedback and traffic reports. Thanks to LWD, we have the ability to make an impressive first impact." Testimony by Tom Ellis, President of Duck Manor Promotions. 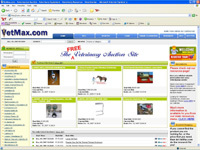 VetMax.com is an online auction website for the busy veterinarian. A huge number of resources can also be accessed from within the site. Greenup Street Properties, LLC is well established in the Greater Cincinnati area providing quality and affordable housing. They needed to establish an online presence where potential clients could view the properties that they had available. Premier Kitchens Inc. brings a unique blend of experience and knowledge to kitchen remodeling in the Greater Cincinnati area. 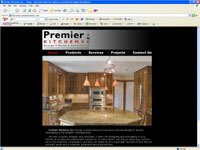 They wanted a professional looking site that showcased their products and services.